The Humber Belles using the LTP stage. Around 6000 people enjoyed the Christmas Craft Market. 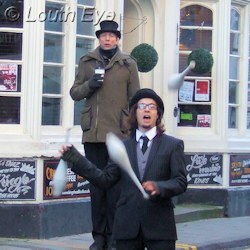 The Louth Town Partnership organised entertainment such as this juggler for the Christmas Craft Market. I may have mentioned before that the Louth Town Council is unanimously opposed to EMAS' plans to close down Louth ambulance station. So it's no surprise that it once again dominated the agenda for 2012's last council meeting, since the consultation deadline of 17th December is looming. Jackie Featherstone gave another update about this, noting that EMAS have been looking at the Cattle Market as a possible site for a stopping point. Councillor Trevor Marris pointed out that the current station in Louth is well situated. "It's so central. It's right where it is," he said. Recently EMAS have put up a 35-page document on their website relating to their plans. It's quite a long read, but it goes into the computer modelling they used to draw up the placements of their proposed ambulance hub stations and smaller stopping points. In particular, there's more in there about their reasons for having only five hubs in Lincolnshire, and the increased travel times that staff will inevitably incur. The Mayor was very critical about this late revelation of new information, and she called for the consultation to be re-run. "You don't do consultation that way," she said. The town council has written a letter to EMAS outlining its objections to the planned changes. You can read it in full here (PDF). Mr Patrick Neville has taken over Louth Town Partnership as its acting chairman, following a recent shake-up, and he spoke to the council about the organisation. Mr Neville explained that ELDC didn't want a councillor in the chair, they preferred to have someone politically independent. This sort of talk makes me grit my teeth. Everything's political, even down to what you eat for your breakfast. Do you think your choice of porridge or bacon and eggs doesn't affect someone's livelihood and power relationships and standing in society? Because plenty of farmers and retailers would disagree. So when someone says they don't want politics to be involved in $WHATEVER, I'm always suspicious that it means something entirely different, or else it's completely woolly thinking. Okay, back to Mr Neville, who has a background in journalism and PR. He went on to describe all the things the partnership does for Louth, including the provision of street bunting and various annual events including the 0 Degrees Festival, the Victorian Fayre and the Christmas Market. These events have gone from strength to strength, with an estimated 5000 visitors to the Victorian Fayre in 2012, and 6000 visitors estimated to have turned out to the Christmas Craft Market on December 2nd. They also organise volunteer snow and ice clearers for the market, co-ordinate the Louth in Bloom committee, and promote the town through banners, posters, and on the internet. For the future they are considering creating a mobile phone app that will function as a tourism guide to Louth. LTP is largely run by volunteers, but it does have funding challenges. From September 2013 its ELDC funding will progressively diminish. Mr Neville spoke about their need to work towards financial independence. 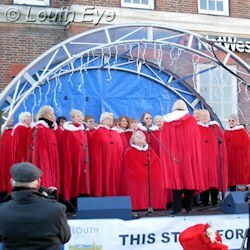 Part of that will come from hiring out the covered stage they own, pictured here being used by the Humber Belles. They also want to design and develop a range of merchandise promoting the town. There is also talk of raising the stall charges for their popular themed events. "I believe we now have the best group of volunteers to move us forward," Mr Neville said. This all seems very fine and dandy. But then we came to the big ask: "We believe we need to upgrade to a full town manager", Mr Neville said. 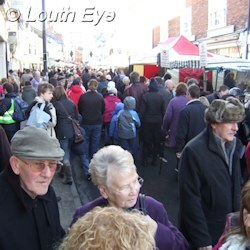 LTP believe that would cost around �50 000, and they want Louth Town Council to contribute to this. Currently Sam Phillips is their co-ordinator, but she's on secondment from ELDC and she isn't a full town manager, with all the experience that entails. She seems competent enough to me, based on how often I notice the LTP promoting the town online, via email and in the town. But maybe the LTP are after a special something that I haven't considered, and only a pay rise can ensure? 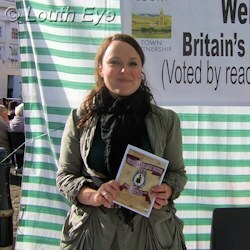 The town councillors were very positive about the organisation. Councillor Margaret Ottaway was dismissive of criticism the partnership had received about the timing of the lights switch-on, saying "I wouldn't accept the criticism" because if the event had been any later people would have left due to the cold weather. Councillor Featherstone commented that "a town needs to have a unique offer, and it's a big help to have a full-time worker." Councillor Andrew Leonard told Mr Neville "What you do has become a fixture on the Louth circuit." He noted that the events had proved very popular. "For a very nominal budget you have managed to put together an awful lot. It's a lot of dedication and commitment. I take my hat off to you." Sadly Mrs Gill Burton has had to resign from her post at the council for health reasons. She has also stood down as a trustee of Louth United Charities. The Mayor praised her contribution to the council, saying "she didn't say much, but when she did speak it was heartfelt". This opens up the possibility of an election for the vacant seat in the new year, so long as there is demand for one. Otherwise a councillor could be co-opted in. According to the town clerk an election would probably take place before March, although May seems more sensible (and cheaper) to me since that's when other council elections are due to take place.